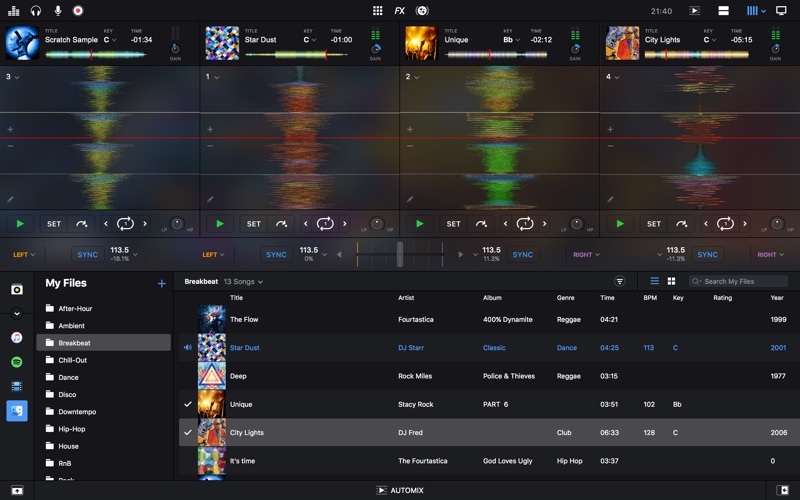 djay Pro 2 is the next generation of Algoriddim’s multiple award-winning DJ software with countless new features, a redesigned user interface, and advanced library management tools. 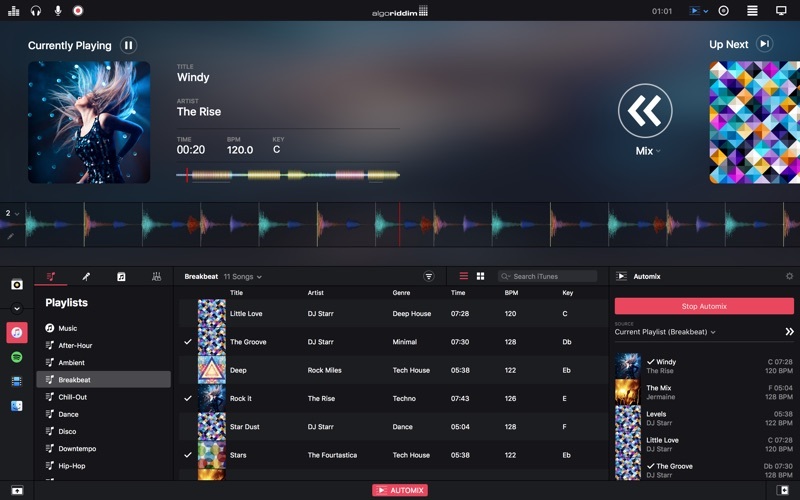 djay Pro’s unique, modern interface is built around a sophisticated integration with iTunes and Spotify, giving you instant access to millions of songs. 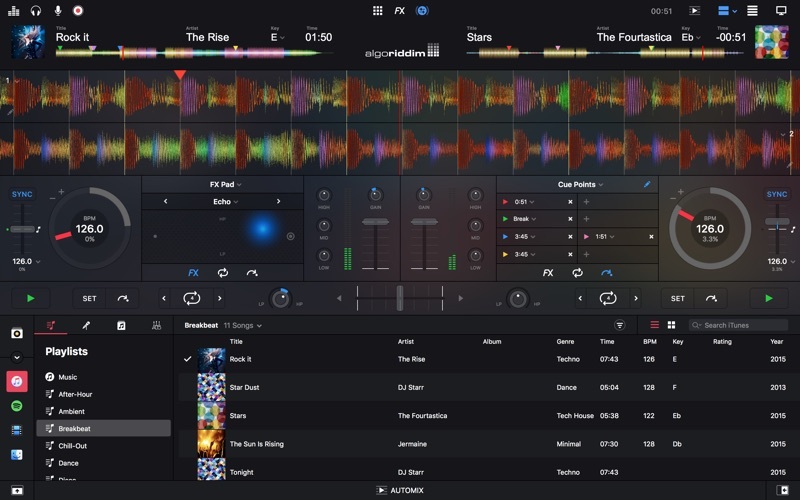 Pristine sound quality and a powerful set of features including high-definition waveforms, four decks, audio effects, video mixing and hardware integration give you endless creative flexibility to take your sets to new heights. 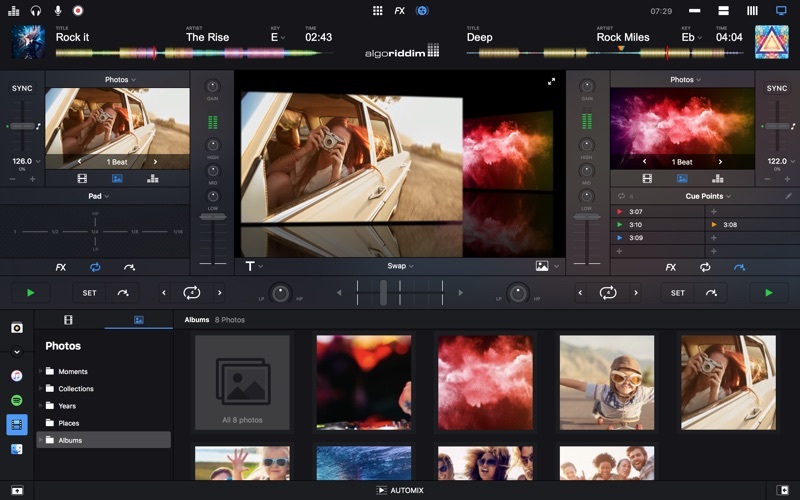 WHAT’S NEW All-new UI • 1-, 2-, 4-deck, and video modes • Modular design with customizable tools, sampler and FX configurations • New high-res waveforms • New Video mode with Photos integration • Single Deck view: prepare your tracks and library • Automix view Library Management • “My Library” section to create your own playlists • Spotify integration • Create smart playlists with tracks from iTunes, Spotify, and the file system • Powerful track filtering: filter any playlist by BPM, key, and other attributes • Split mode: show two library sources side by side Automix AI™ • Automatic, beat-matched mixes based on artificial intelligence • Queue and Playlist automation • Automatic transitions • Match powered by Spotify PhotoBeat™ • Mix photos in perfect sync with the beat • Beat-matched automatic photo slide shows • Adjustable frequency of photos per beat • Image effects Advanced Features • Keyboard Shortcut Editor • Save up to 8 loops per song • Assign names to saved cue points and loops • Cue Loops New audio engine • High-quality, low-latency audio engine • Post-fader FX • High-quality effects, filter, and EQs • Master output effects via AudioUnits FEATURES OVERVIEW Spotify Integration • Instant access to millions songs • Playlists, Songs, Charts, Browse • Match: cloud-based song recommendations • Instant access to BPM and Key information through the cloud • On-the-fly playlist editing and song saving • Drag & Drop from Spotify app • Powerful audio streaming technology: ultra-low latency, advanced effects, on-the-fly analysis CDJ Integration - officially certified by Pioneer DJ • Native support for CDJ lineup • Guided plug & play setup • Full hardware control including slip mode, scratching, pitch bending, looping, cueing, master tempo • Library navigation including Spotify, iTunes, waveforms, and cue point display on the CDJ screens • Connect up to 4 CDJs Recording • AAC / WAV • iTunes export Audio Processing • Advanced time-stretching (up to +- 75%) • Pitch shifting (up to +- 1 octave) • Audio mixing with adjustable crossfader curves • EQ, panning, and highpass/lowpass filtering • Audio Limiter • Support for Audio Unit plug-ins Audio Analysis • BPM and beat detection • Flexible beat grids with support for dynamic tempo • Frequency-based colored waveforms • Key detection • Auto-gain / Normalize • Multi-core batch analysis Hardware Integration • Native support for over 50 MIDI controllers • Native support for Pioneer DJ CDJ lineup • Advanced MIDI Learn • External Mixer Mode • Support for multi-channel USB audio interfaces • Support for external audio input and microphones Built for macOS • Support for Touch Bar • Native 64-bit application • Optimized for MacBook Pro and iMac with Retina Display • Multi-core analysis (up to 24 processing threads on 12-core Mac Pro) • Extensive keyboard shortcuts • Multi-touch trackpad control • iCloud integration • Accessible via VoiceOver djay Pro 2 is compatible with any Mac running macOS 10.11 or later. A Spotify Premium subscription and an internet connection is required to access the Spotify music catalog from djay Pro 2. No recording available for songs from Spotify. To use songs from iCloud in djay Pro 2 please download them first via iTunes. DRM protected songs are not supported and djay Pro can not access tracks from Apple Music. The app freezes while loading the application. It doesn't load up fast like it used to, it just freezes and doesn't respond while the color wheel is spinning telling me, that it's still loading. I tried restarting, reseting, nothing works. This software is pretty good! I like this a lot. I really like how the songs beat grid even older tunes get a good beat grid...Other softwares haven't figured that out for some reason...I don't know why? Only things I would change would be the song keys only being by the letter key and it doesn't say major or minor. It would be nice to have the camelot system. Also...the effects I don't completely understand. the echo is funny in how it works. It doesn't go by beat or even tap tempo which makes it kind of awkward to use in my opinion. The automix is a nice feature for convenience but I'd like a feature where you can set your own hot cues for when you want the song to drop in and out and use that with automix. Also, why can't you record your session using spotify tracks? I guess I can record to an external source and throw that mix back into my computer for later use but you should be able to just do that in the software. It's kind of silly...if someone wants to record their session they're going to find a way to do it. Just my two cents. I recenty purchased the pioneer ddi-sx3 before i purchased the dj controller i check algoriddims ( Creator Of Djay 2 ) to make sure the sx 3 was compatible with the controller and my mac. 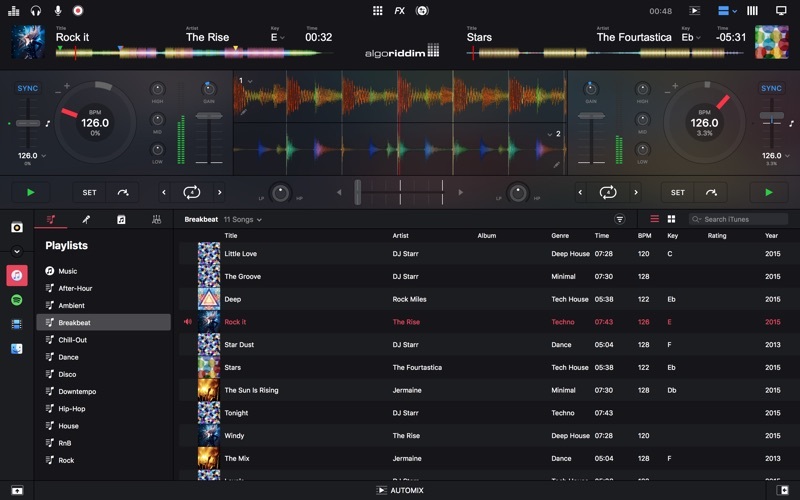 The website shows that it is compatible which i was very excited and happy with because i like the djay software its what i started with. i payed for the djay 2 software and bought the fx packs. To my suprise the sx3 is not working properly with djay 2 which is upsetting after all. some of the isuues are : not recognizing certain buttons and giving issues while trying to use it which i can not have an event so its serato for now and it looks like my money was watsed and i feel lied to. Not sure what the issue is but everytime I open the app it freezes, spinning wheel of death, once I start going through the music library to find songs. I haven't even played anything yet. The whole computer sludges to a halt. Took me well over 20 minutes just to force quit the app. Hesitating to open it again. the use of spotify is a game changer, but.. The skin/platform is super basic. The seasoned Dj's need more detail and information when it comes down to playing real sets. I will use this program for weddings, and random events for ease of use on the fly, but only as a back up to Virtual DJ. When I'm DJ'ing for fun, I use Serato. The Only DJ app I use. This is super nice with, super smooth. Even on all of the apple products I have, keep up the great work. This most defintley brought me to and professional tier. Thank you kindly. Love this app I finished the demo days and had to purchase it after.